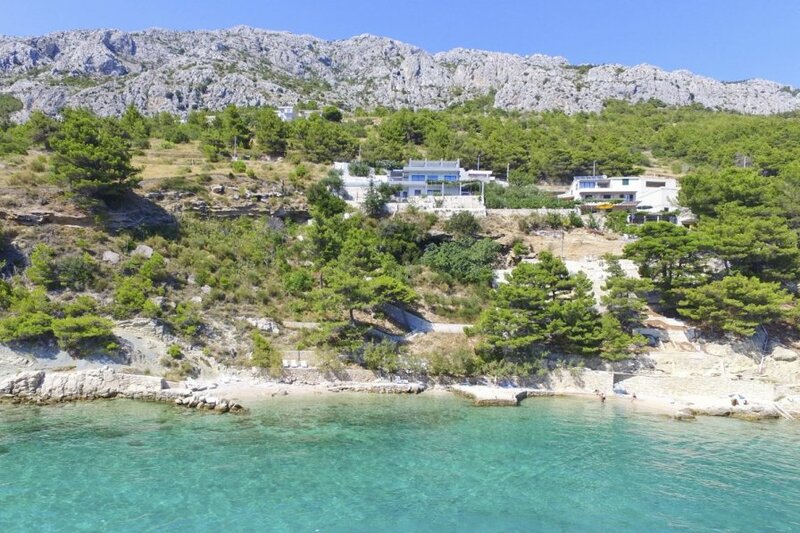 This fantastic modern villa is situated just moments from the delightful town of Mimice, on the Dalmatian coast. With spectacular views out over the Adriatic Sea and the Island of Brac beyond. On the ground floor you'll be delighted to find an ultra modern open plan living/ dining space, filled with natural light and stunning design features, with a well-equipped kitchen. This leads out onto a wonderful little outdoor dining area, shaded from the sun, featuring a huge brick barbecue, an ideal space for entertaining on those warm Croatian days. Also on the ground floor you'll discover three double bedrooms, all decorated in the same sumptuous contemporary decor, and all with double beds. One has the benefit of a beautiful en suite, another has access to the fabulous sun-drenched terrace. There is also a family bathroom on this level for your convenience. Upstairs you'll be greeted with two further stunning bedrooms, both benefiting from access to another sun terrace boasting spectacular views. One has an en suite and the other has the luxury of an in-bedroom bathtub for two, where you can thoroughly relax enjoying a glass of bubbly while appreciating that magnificent vista. The smart design continues to the outside space here at Villa Cliff. With a combination of stylish decking and hideaway seating areas, the terrace area focuses around a fantastic infinity pool, ideal for cooling off in on those warm afternoons. Or perhaps you'd rather indulge in the most decedent feature at the property, it's own private beach, just 199 steps down from the terrace. What more could you ask for. Located between the mountains and beautiful gravel beaches, you'll be ideally placed to enjoy its selection of quiet bars and restaurants. Along the beach you'll find some lovely options, where you can enjoy the fresh catch of the day, straight from the fisherman's boats. There's a delightful old tavern you won't want to miss, selling fine local wine and fresh grilled fish, exuding an ambience you just won't want to leave. The lovely beaches in the area make this an ideal destination for families. Shallow waters, protected bays, crystal clear waters and a convenient pedestrianized zone along the coast, mean that a day on the beach with your little ones couldn't be easier. There are two public beaches in Mimice itself. For the adventurous amongst you, scuba diving, surfing, boat trips or even night fishing are all on offer. If you're looking for a little more hustle and bustle, a short drive into the old pirate town of Omis will provide a greater selection of nightlife, a large shopping Centre and an array of sporting activities from rafting to canyoning. The Venetian fortress that looks out over the town from the hillside and a 17th century parish church are charming landmarks worth a visit. There are also opportunities here to arrange day trips to neighboring Islands, the National Parks of Krka and Pritvice, and the beautiful city of Dubrovnik.